recently luís antero, curator of the green field recordings label, and producer of the radio show o colecionador de sons (the sound collector), invited me to produce a piece to celebrate one of the last broadcasts of his show before he leaves on an extended hiatus. it was an honor, and i took the opportunity to explore an idea that had recently come up. the resulting work, entitled raadio mälu (radio memory in estonian), debuted on portuguese radio on the the 13th of may, 2013, and was then rebroadcast as an edition of framework:afield on the 19th. a few months ago i found a small portable radio, dating probably from the 1980’s and made during soviet times, is a secondhand shop in the small village of mooste in southeast estonia. i have a thing for old radios, so i bought it, and it got me to thinking about the place of radio, not in this present world of internet streaming, podcasting and so forth, but in our past, and in our memories. i know i have distinct memories of radio, radio stations, djs, events, situations, and even places that i relate to radio from my own past, growing up in boston, during my student days in western massachusetts, all the way through my years at the resonance fm studios in london, and my attempts now to listen to estonian radio to improve my language skills. i wondered if this particular radio, alien to me but possibly familiar to estonians, might trigger memories for those around me, and i decided to find out. i composed this piece from four elements: memories, stories and observations from a handful of estonians, related upon being presented with this particular radio for the first time; sonic material produced by the radio itself, both when tuned to and tuned between stations; field recordings from the surrounding landscape, vibrations in the immediate airwaves that have carried these radio signals; and archive material from estonian radio’s past, both in and before the country’s soviet era. the estonians interviewed were given the choice of speaking in their native language or in english; two chose estonian, and two english. i have left the estonian language untranslated in the audio itself – much of what is being communicated can be heard in the tones of their voices, and through shared vocabulary. that said, i am providing a written translation for the estonian language sections below. It is, yes, made in USSR. It’s from Russian times. But with this one you couldn’t listen to Voice of America. This gets mediumwave and longwave. For Voice of America we used shortwave, 25, 31, and 49 meter bands. But this is… yes, with this one it should be possible… wait, let me check. It’s stuck in the bag. “Selga”; you see? It’s just as I thought, Selga. Produced in Latvia. Latvia made things like this. But let’s see which wavelengths it has – should be mediumwave and longwave. I had one just like this; I used to listen to German music with it. They played very good German music, on mediumwave. And it works? Yes, it’s got mediumwave and longwave. I used to listen to broadcasts in English on shortwave. We also had one of these Riga radios at home. They made a lot of these in Riga. All kinds of different machines. And then we also had a Radiotehnika, I used that one a lot too. I couldn’t speak any English yet, but i just listened to how good it sounded. It has such a nice timbre. Mother also used to listen to English radio – or which language did you listen to? Did you listen to Estonian? Mother doesn’t remember anymore which language she listened to. But yes, there was really good music. So this is from the Radiotehnika factory – RRR: Rigas Radiotehnika Rubnika. RRR, the factory’s mark. “Rigas Radiotehnika Rubnika” in Latvian. Selga 405. 29 rubles. 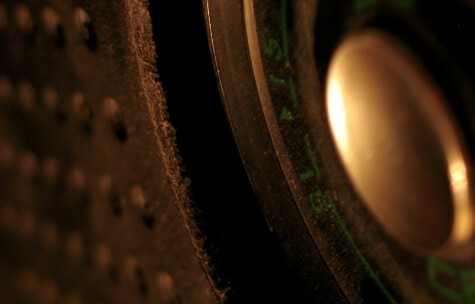 Radio receiver. Look how well it’s preserved. Still working. It’s old already, probably 30, 35 years at least. Quality mark; this is a quality mark. SSSR. Here you choose longwave or mediumwave. It works well. ah, German. German? ah, one of them is speaking German, the other English. It works very well. Italiano – no, maybe not. No, I don’t know. Still English probably. Italian? He’s probably talking about the pope, who’s giving up his position. Is he giving up his position? It’s very sensitive, receiving very well. Don’t know what language that is. And what langauge is that? Ha, Big Brother language. Mine was light colored and had a colored bag as well. And a strap, like this one. This is of course newer than mine was. But that one I think broke. I don’t remember what was wrong with it. It’s a radio, made in the Soviet Union. It has a black leather cover, a bag that has a strap that can be adjusted to different lengths, so that you can, for example, put it over your shoulder on the street and take it with you. Very comfortable. The bag has a nice soft texture on the inside. It has two snaps that you can close it with. The radio itself is rectangular, with two buttons: one for the volume, the other maybe for the frequency. The bag has one round hole, through which you can see the frequency indicator. And then there are many small round holes, to let the sound through. On the back there are some more holes. I don’t know what these can be for. Maybe for the radio to get ventilation. And then there is one hole through which headphones can be attached. And there is one more button with which, probably, different wavelengths – longwave, shortwave – can be selected; you can choose. Many words have been embossed on the bag, for example “made in USSR”. The radio is totally rectangular; the button is round and the speaker part is rectangular with small holes. The brand is Selga. The words on the indicator are green, and the pointer is red, and a bit transparent. On the indicator there are numbers: 1.5; 2; 3; 4; 5.6; 6.5; 8; 10 and 15. On the back is written Radio Prijemnik. Selga-405, type APP 4. Cost 29 rubles. the framework:seasonal series of fund-raising audio releases continues with a very special issue #3 – the great chris watson, who, we’re sure, needs no introduction amongst framework listeners, has donated a single-take, 2.5 hour field recording from the rainforests of borneo, recorded and published at its full length at higher-than-cd audio quality. this stunning recording has never before been released, and has been donated by the artist in support of framework radio. it is available only through framework, in exchange for your donation of €20 of more on the framework website. each dvdr is slow burnt onto the highest quality taiyo yuden archival discs, and is hand-stamped with the custom-made image of a borneo-native mushroom, in keeping with the previous issues of the seasonal series. each is housed in an offset and folio printed sleeve from a local printing press, on paper from a local papermill, both here in the southeast estonian town of räpina. the insert as well is printed on additive-free paper from the räpina mill. these audio dvdr’s will play in any standard dvd player, or on any computer. to order your copy donate €20 or more by clicking here, or visiting http://www.frameworkradio.net. we’ll be in touch to confirm the best shipping address. 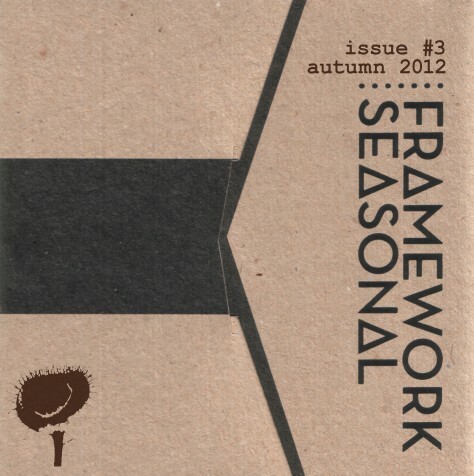 copies of previous issues of framework:seasonal are also still available – donate €20 or more per issue and let us know which ones you’d like! support framework radio and donate! this edition finds itself in much more industrial territory, in the literal sense of the word, with machine drones, empty spaces, printing presses, public transport; quite a cacophany, but not without some natural respite away from city sounds. 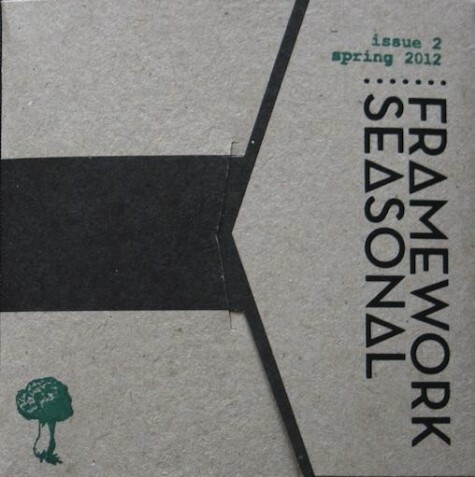 framework:seasonal is an ongoing series of compilations in support of framework radio – all works are donated by the artists, and the releases are only available directly from the framework website, in exchange for a donation of 18€ or more, or a subscription donation of 5€ per month or more. please support framework’s efforts and give! copies of issue 1, autumn 2011, are also still available, as well as just one or two remaining copies of the massive framework250 4-disc set from 2009.